The pressure on Syria is mounting. Saudi Arabia, Kuwait and Bahrain have all just recalled their ambassadors following a bloody weekend that saw at least 100 pro-democracy protesters killed, according to activists on the ground. In effect, Anonymous mentions the “paradox of repression,” calls on the protesters to maintain their nonviolent discipline and urges members of the security apparatus to defect. 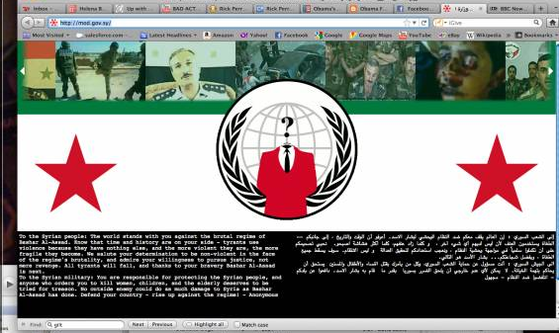 In addition to this message, The Next Web writes that at the top of the Ministry of Defense’s page Anonymous posted scrolling “links to videos illustrating the unrest, deaths and civil injustice in the country,” and at the foot of the page were “a number of links to protest group websites, Facebook pages and Twitter profiles all campaigning against the actions of Syrian President Bashar al-Assad and the military.” Well done!